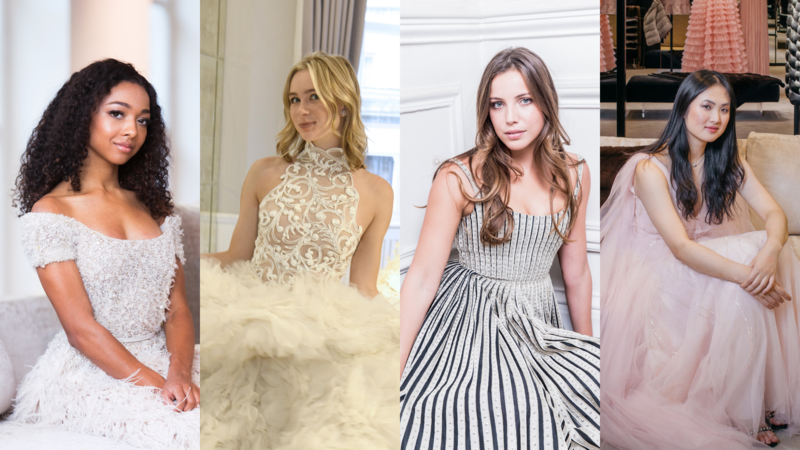 Under the gilt mirrors and ornate Louis XIV staircases of the Shangri-La palace hotel in Paris, some of the world’s most beautiful young women gathered together last night for the annual couture-fest otherwise known as the Le Bal Des Débutantes. The glittering event is organised by chic French PR maven Ophelie Renouard and takes place in the old-world ballroom of the Shangri-La Paris. Renouard donates the night’s entire proceedings to two charities: the New York City-based Seleni Institute, which supports the reproductive and mental health of teen mothers, and Enfants d'Asie, which promotes the education of young girls in Southeast Asia. Debutante balls have been a fixture on the European social scene for centuries—traditionally a way for aristocratic girls to be presented to society and yes, to find a well-to-do husband. Who is she: The daughter of Oscar-winning actor Forest Whitaker, True is wearing Jean Paul Gaultier—and had her dress fitting with Gaultier himself, who couldn’t believe how perfectly his creation fitted the young writing student. True lives in New York and while she once planned on following her famous father onto the silver screen, she’s decided her talents lie with filling the blank page, and is hoping for a career in journalism and creative writing. Her cavalier? Only the grandson of renowned French actor Jean Paul Belmondo—Giacomo Belmondo. Who is she: It’s a case of career musical chairs here in Paris, as True’s childhood friend Juliet Gordy comes from one of America’s most influential music families—her grandfather Berry Gordy is a record producer who launched Motown superstars including Diana Ross, Marvin Gaye and Stevie Wonder. But Juliet wants to act, and she’s already well on her way with a role in a new Netflix series that starts filming next spring. For Le Bal, she wore an exquisite Elie Saab gown with a full princess skirt. Who is she: The daughter of Robert Lee—an avid art collector with a keen eye for 18th-and 19th-century French and Italian pieces—HKU student, Angel, felt very at home among the priceless European artworks of the Shangri-La. Her mother, meanwhile, is the famous Hong Kong actress Iwanbeo Leung, and we can see where Angel got her style and beauty from. Last night she showed that off with aplomb in a Dorian Ho dress, while her cavalier was Eduoard Lanvin, from the French couture family. Who is she: The daughter of telecommunications tycoon and AT&T founder Craig McCaw, Julia may be an all-American girl, but she already has a European je ne sais quoi about her. That’s because she is mid-way through a gap year living in the French capital, where she is sharing a Marais flat with fellow deb, Anna Pei and learning to cook at the Cordon Bleu. In her Giambattista Valli gown with Gregory Peck’s grandson on her arm, she also glittered like a 1930s film star. Who is she: Her father started Huawei—the largest telecommunications equipment manufacturer in the world—but when Annabel is not attending Europe’s most glamorous parties, the young Harvard student is still deciding whether or not to join the family firm. Last night, she wore a gorgeous J Mendel number in pale pink on the arm of a Belgian prince. Who is she: With a name like that, you would expect Ludmilla to be rather grand—but while she may come from one of the world’s most famous banking families, the law student couldn’t be more delightful, lighting up any room with her easy-going smile. She wore a head-turning black and white Stephane Rolland gown that deserves a leading role in the next series of The Crown. Overheard: “I’m so excited about all the new friends I’ve made from Le Bal, I love the fact there’s no competition between us, we’re all just delighted to have this experience together." Who is she: Gabrielle’s family history is more than a little dramatic—her ancestors fled Paris in the French Revolution and took refuge in Luxembourg, where they still live. Happily, times have changed, and Gabrielle was educated in Paris—although she currently lives in Hong Kong, where she is helping promote wine from Bordeaux in the Fragrant Harbour. Who is she: The granddaughter of the US ambassador to the UK, Elizabeth is now a citizen of the world—she looks like an all-American film-star but also speaks fluent French and grew up in London. Although at last night’s Bal, everyone remarked upon how reminiscent she was of a young Marylin Monroe in her structured Ralph & Russo gown in pale pink. Currently studying at Brown University, the young beauty celebrated the night with both her parents and her three siblings by her side.